A new passenger assistance app is due to be rolled out across the rail industry from autumn 2019. London Northwestern Railway and West Midlands Railways are two of four train operators currently trialling the new system.The app will make it easier for customers to book help at stations and will give staff the tools they need to deliver a consistent and reliable service. 85% of customers are already satisfied with their passenger assistance experience, according to the Office of Rail and Road (ORR). With this new technology, rail operators hope this can be improved even further. Customers will be able to book, change and cancel assistance quickly. They will also be able to create a user profile, specifying their personal details and the type of assistance they need. Staff will be able to receive live information, including key details about the customer, so that they can anticipate and deliver changes that occur in planned assistance. The system has been developed in collaboration with disability charities including Scope, RNIB and Anxiety UK and includes accessible features, such as the ability to change colour themes, fonts and text sizes. 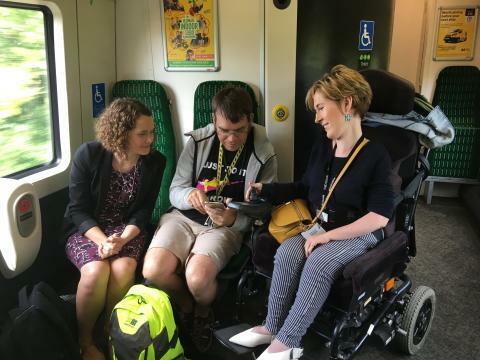 Sarah Ward, who uses a wheelchair due to a neurological condition and has Asperger’s Syndrome, has been trialling the app with West Midlands Railway since May. London Northwestern Railway recently featured in the National Rail ‘No boundaries’ art exhibition. The display, which toured major railway stations around the country, was inspired by the freedom that train travel can bring to those facing various accessibility challenges. Artist, Emma Johns, travelled from her home in Long Buckby to St Ives in Cornwall by train, and used the journey as inspiration for her work. Passenger assistance is aimed at anyone who needs help with their train journey, from people with disabilities to parents with prams to elderly people. The rail industry has committed to increasing access to the railway, supporting more people to travel by train, in their long-term plan to change and improve, In Partnership for Britain’s Prosperity. Customers will still be able to book using the national freephone number on 0800 022 3720, which will forward them to the train company they need. 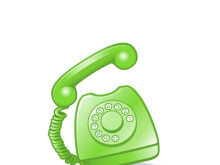 By textphone, customers can use the free textphone forwarding service on 60083, which will send them the number they need.Customers can also book online at disabledpersons-railcard.co.uk/travel-assistance/. If customers want to book by email or fax, they can contact their train company directly. ORR’s Measuring Up: Annual Rail Consumer Report 2018 states that 85% of passengers are satisfied with Passenger Assist, but when the service fails it can lead to significant anxiety, distress and at times loss of confidence. “This app as part of a wider overall Passenger Assist can really improve the journey experience of Disabled and older passengers, whether they use the app or not.We look forward to the rail industry backing this step change in the service our members receive”. 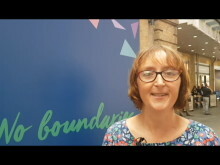 An aspiring artist from Norton, near Long Buckby, is featuring in a unique exhibition celebrating the freedom of train travel for those facing a range of accessibility challenges. Emma Johns is one of a group of artists who have produced pieces for the National Rail 'No Boundaries' display.